The J.D. 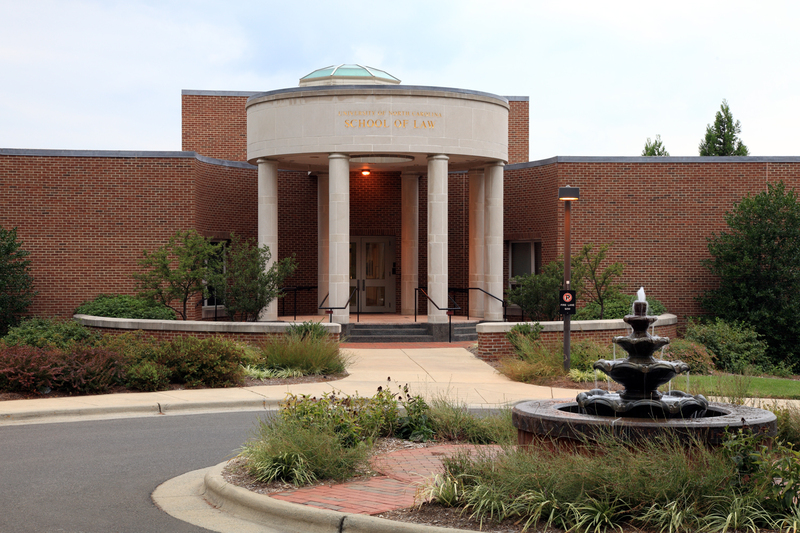 program at UNC School of Law provides students with a broad legal education that will prepare them to begin their legal careers at a high level of readiness to pursue their professional goals. In recent years, law schools nationwide have been responding to the legal community's need for students to obtain additional practical skills while in school, and Carolina has responded with curriculum changes and additional extracurricular skills-training programs and offerings. The School of Law at The University of North Carolina at Chapel Hill is, according to students, “one of the best public law schools in the country.” Many claim that “the fac­ulty here couldn’t be more down to earth and accessible.” They have “a literal ‘my-door-is-open-all-the-time policy’ and never hesitate to “[take] the time to talk to every single student before class.” Still, some students feel that “there is a strong liberal bias at the school” and that professors sometimes “bring their political views with them into the classroom.” To correct this, they are calling for the law school to “improve on fostering a more diverse political atmosphere.” UNC Law’s “excellent” and “accessible” adminis­tration is “unparalleled” in its efforts to promote a “positive and supportive environment for the study of law.” Everyone here seems to practice “the ‘We’re all family at UNC’ motto to a fault.” Most UNC survey respondents are pleased about their employment prospects. One student credits the Career Services Office as being “the greatest strength of UNC. Even when they are too busy for a brief meeting about resumes or cover letters, you can just leave your stuff under the door, and someone will get it back to you by the next day with recommendations about what you should fix.” However, some feel that it could “stand to improve, particularly with communicating jobs to 1Ls.” However, jobs in North Carolina and neighboring states are fairly abundant, though, in large part because the law school maintains “strong connections” with in-state employers. Student organizations and learning opportunities are aplenty. According to one student, “There are lots of organizations to get involved in, and the pro bono program is one of the best.” About 60 percent of all students do some kind of pro bono work—many during the summer or during winter or spring breaks. Students who have performed more than seventy-five hours of pro bono service receive certificates of acknowledgment from the state bar association, and those who perform more than 100 hours of pro bono service get special shout-outs at graduation. Other notables include UNC’s clinical programs, in which students handle more than 350 civil and criminal cases every year and “really get a lot of hands-on experience” along with “solid academic[s]” in the process. Joint-degree programs include the standard JD/MBA as well as master’s of public policy science and a handful of others. UNC also offers a summer program down under in Sydney, Australia, that concentrates on Pacific Rim issues and semester-long programs in Europe and Mexico.The general consensus is that facilities at UNC are middling, but in terms of the avail­ability of information, “The resources are outstanding.” Also, “The school is improving the technology of each classroom every year.” In the meantime, a cry of “more parking!” can be heard throughout campus. Want more info about University of North Carolina School of Law? Get free advice from education experts and Noodle community members.